The dress is by Giambattista Valli, the stole is from Oscar de la Renta. It’s been a tradition of mine for the past few years to see the Bergdorf Goodman holiday windows and my favorite time to go is at night when it’s easier to see the windows without any glare or reflection. There are also less people at night so you can actually get up close and have a good look at the amazing clothes, accessories, and displays. 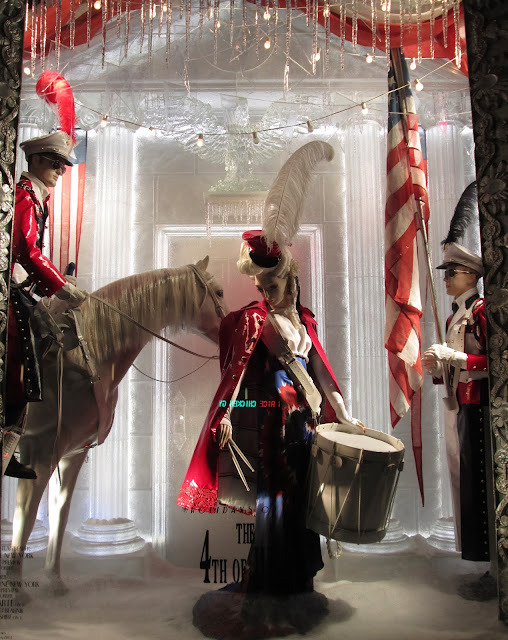 The theme of the Fifth Avenue Bergdorf windows this year is “Holidays on Ice”. They were a little more low-key than last year’s over the top windows but I loved them anyway. My favorites were definitely the Valentine’s Day window, the Halloween window—which features a 1/8-scale model of Cornelius Vanderbilt II’s Fifth Avenue mansion—and the Groundhog Day window. The entire window. So girly and pink and wonderful! Have a look at the inside of the cabinet! I love the Edward Gorey feel to this window. The dress is a custom-made Naeem Khan. The mansion of Cornelius Vanderbilt II depicted in the Halloween window stood on Fifth Avenue and 57th Street, where Bergdorf Goodman now stands, from 1883-1928. It was, and remains, the largest private residence ever built in New York City. I of course had to go look it up once I read that. Here is a photo of it. 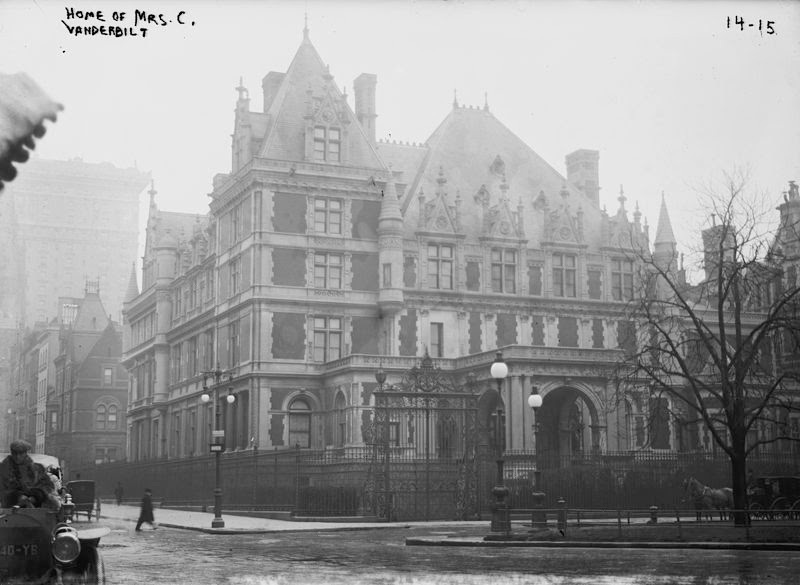 The mansion of Cornelius Vanderbilt II, at 1 West 57th Street and 5th Avenue.Wow! Old glamorous New York! The 4th of July window. I love that red coat by Thom Browne! What a great detail on this shoe by Charlotte Olympia. The April Fool’s Day window with its upside-down view. The Groundhog Day window was one of my favorites. I love seeing the delight people take in these windows, which feel like a series of gorgeous presents from Bergdorf Goodman to every person who walks by and stops to take a look. 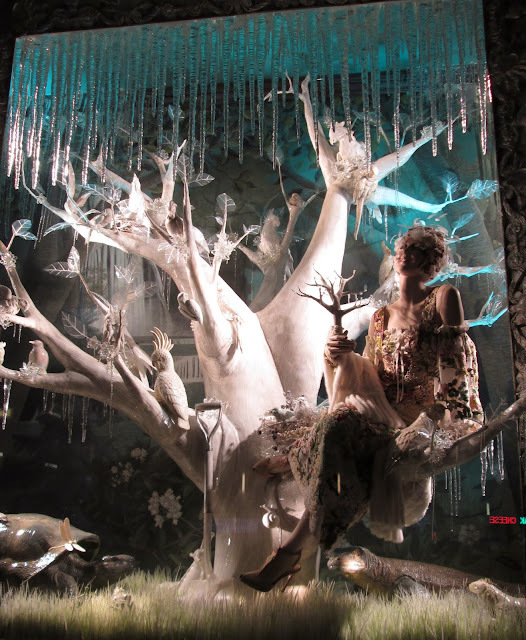 After seeing the movie Scatter My Ashes at Bergdorf’s earlier this year I understand how much work and planning goes into these displays, which makes me appreciate them more. It’s always fun to watch people’s reactions to the windows! It really is a magical time in Manhattan when the stores put up all their holiday lights and displays on Fifth Avenue. You can feel the happy energy in the cold air and that combined with so many beautiful things to look at—I don’t feel the need to own them, looking at them is enough for me—plus sharing all that beauty with a friend, as I did this year, reminds me how very much I still love New York. I wish you a wonderful Thanksgiving and a happy kickoff to your holiday season! What a thrill to see these through your eyes and camera! I love them all, especially Halloween, and you really got me with the April Fools. I thought you had posted the photo up-side down! Jill, I love it so much that you do this! Thank you! I am so overdue for a trip to NYC. Miss it at Christmas! Jill dear-these windows are gorgeous. You remind me of a most special trip to NYC, where we viewed the windows at Bergdorfs (stunning) six years ago. It was a family trip and it was wonderful. The following year we were shockingly in the hospital with my dad-following a devastating cancer diagnosis. He was gone 19 days later. That trip to NYC is such a sparkling memory in my mind. Thanks for sharing such beauty. Wow Jill! Loved this. 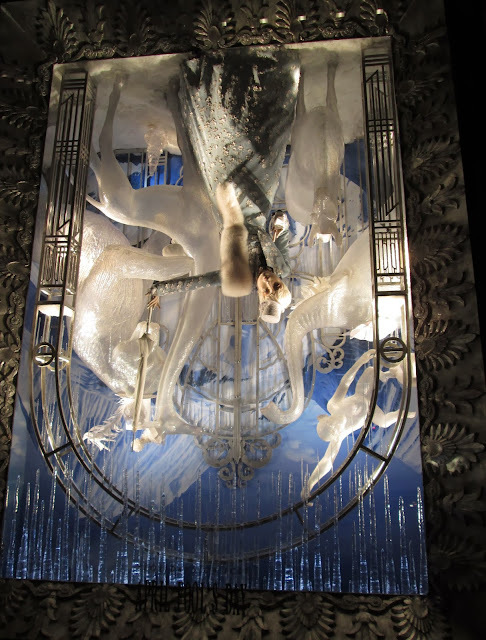 Bergdorf's was one of my favorite spots when I visit NYC. It's been a long time and I need to get back. The windows are amazing. Did they keep the mansion and build the store around it? Wasn't it something? Thanks for sharing and enjoy your New York at Christmas! These are magical. I love all of the displays across the city.